It was a new experience, fly fishing a coastal inlet salmon river with a shotgun guard. But, it was necessary for we were on one of those mainland coastal rivers which has a prolific run of salmon and, a large population of grizzly bears. This past fall I had a number of contacts with bears. All were positive and they gave me much pleasure to observe this memorable mammal of our forest and stream. 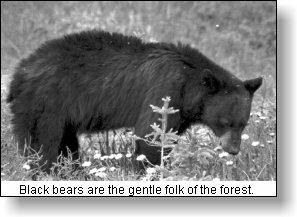 British Columbia has about one quarter of all black bears in Canada and about one half of all grizzly bears. Bears are special because they, more than any other North American mammal, show many human traits. They can be humorous and they can be dangerous; they lumber with a rolling gait or, they will bolt with incredible speed, twice that which humans can attain; their blunt face shows a vast variety of expressions; and, they exhibit a raw power which is the envy of all. My first contact this past year occurred while I was blue grouse hunting in a coastal logging slash area. I had walked around the slope of a ridge and found myself looking at a perfect area for blues. There was a small pond in the middle of a basin, a wet zone which I knew would attract those blue grouse who were not yet ready to migrate uphill to winter in the evergreen forest. As I approached the pond, I spotted a black bear swimming and obviously cooling himself in a clear area of the pond. At that same moment, Mykiss, my hunting dog, came around the ridge with his collar hunting bell ringing. The black bear never paused, in one smooth motion he swam to the edge of the pond frothing water all the way, then leaped up on a fallen log before bolting up the hill on the far side of the basin. Here he paused for a moment, trying to focus on the sound of the bell, then, he disappeared in the thick brush on the other side. 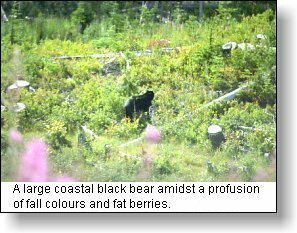 This was a typical Vancouver Island solitary black bear, one of many that live their secluded life on our coastal mountain slopes. My second contact occurred on the road to an Interior trout lake. It was early in the morning when we turned a sharp corner near a meadow. There, feeding on tangy fall berries was the biggest black bear I can remember seeing. The bear continued feeding when we stopped about a 100 yards away. With my binoculars I could see the rippling muscles as it torn the branches and then the delicate tongue and lips as it plucked berries from the broken branch. My third contact came while I was on an ATV tour of two salmon spawning rivers in Rivers Inlet. 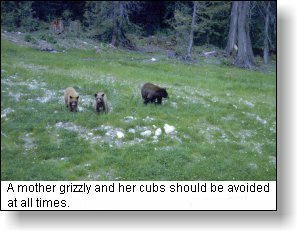 We were in active grizzly bear country and were prepared with a shotgun in the front ATV and another in the rear ATV of our four vehicle caravan. Fortunately they were not needed but we did have contact with three grizzly bears. Bear sign was everywhere on the access logging roads we traveled. Our first grizzlies greeted us at a salmon pool where we stopped to fly fish for coho. It was a mother with a two year old cub standing on the opposite bank of the river. Grizzlies are unpredictable and we cautiously moved back up the trail to vacate that pool. Our next contact came as we traveled along one side spur road. This time it was a large male and he bolted when he spotted us coming, a dangerous situation for protection of territory is one of the strongest reactions of grizzly bears. Our final contact that day came at the entrance to an ancient cave. Our guide brought us to this location to see ancient carvings but, at the entrance was the fresh footprint of a very large bear. We beat a hasty retreat, discretion being the order of the day. Earlier in the month I had traveled to our Pacific Rim National Park. Twice on the highway alongside the Kennedy river I saw black bears feeding on berries and plants. At the park information station we were given their pamphlet, "Warning, You are in Black Bear Country," because bears had been spotted in the park that week. In all, these numerous contacts reminded me of how fortunate we are to see these usually secluded and shy large mammals, the gentle forest folk. 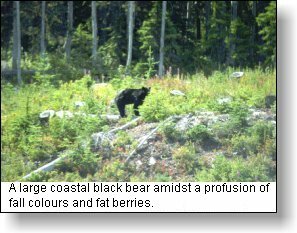 It is surprising that most coastal islands like Vancouver Island are home only to the black bear. For reasons unknown, the grizzly bear has never crossed the water moat between the mainland and Vancouver Island even though they are good swimmers. Some basic facts about our common black bear Ursus Americanus show us that it is one of the most common wild animals in North America. The black bear is approximately 150 cm ( 5 ft) long with males weighing about 135 kg and females weighing about 70 kg. Exceptionally large males weighing over 290 kg have been recorded. The normal color is black with a brownish muzzle and a white patch below the throat. Black is the most common color but other color phases also occur like brown, cinnamon, blue black, and deep brown. Black bears are surprisingly fast when they need to be and have been clocked at speeds of 55 km/h. They are also good swimmers. Tree climbing is second nature to the black bear who will bound up tree trunks with surprising speed and ease. Make your presence known by talking loudly, clapping, singing, or occasionally calling out. Every bear defends a personal space. The extent of this space will vary with each bear and each situation. Bears aggressively defend their food. All female bears defend their cubs. Never attempt to feed a bear. Food odours attract bears. Do not store food in your tent. Don't sleep in the same clothes you cooked in. Remain in your vehicle if you encounter a bear at the roadside. Keep the windows up. There is no guaranteed safe distance from a bear - the further the better. Parks Canada has this to say about chemical bear repellents; "Chemical bear repellents or Bear Sprays contain capsicum, a derivative of cayenne pepper, which when delivered to an animal's face causes immediate irritation of the eyes and upper respiratory tract. However, because of wind and other circumstances of an attack, the spray cannot be considered an absolute guarantee of safety. Despite the limitation, reports have credited the spray with saving lives." As I said earlier, bears are a solitary mammal and a pleasure to observe in the outdoors. They are very common and rarely dangerous, but, they do need to be respected. My encounters this past fall were one further outdoor experience that has highlighted my outdoor diary.